The recently opened Scribner's Catskill Lodge is quite a sight. Originally opened in 1966, the thirty-eight-room ski hotel at the base of Hunter Mountain in upstate New York has new owners — and a brand new, super gorgeous look. You can tell by looking at old photos that the original hotel, once called Scribner’s Hollow Motor Lodge, has always had good bones: Peeked ceilings with beams, walls lined with wood paneling, stonework and tiles. Built-in fireplaces. Rows of private balconies from which to watch the sun set on the mountains beyond. You know: classic mountain town stuff. Scribner’s offers lots of small delights, too. For example: The bundles of graham crackers, chocolate, and marshmallows left in each guest room meant for S’more-making at the nightly bonfire. Or, the terracotta-tiled bathrooms stocked with the hotel's signature lotions and shampoos — addictive blends scented with rosemary, laurel, and mint. Or, the stacks of magazines (Modern Farmer, Surface, Brooklyn) and funny vintage books for reading while cuddled up near the central fireplace. Or — my favorite — the fact that the whole place is dog-friendly, so no matter what you’re doing or where you go, you’re sure to see a furry face doing something cute nearby. With "adventure concierges" on hand to help you plan everything from skiing to hiking to yoga, and Prospect, the excellent in-house restaurant serving brunch, cocktails, and dinner, we're pretty sure Scribner's is destined to attract a crowd. To that we only have this to say: Book now, friends, book now. You know: Before word gets out. The new lobby stands on what was previously the hotel's entrance drive; the original paving bricks have been preserved. Handmade textile art by The Catskill Kiwi decorate many of the walls. New York City-based firm Studio Track designed the interiors. 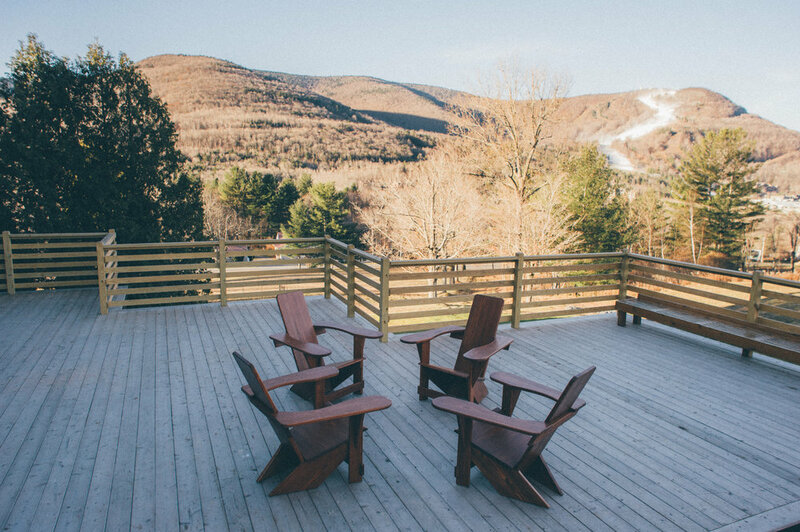 Private balconies and large communal verandas allow sweeping views of the surrounding Catskills and Hunter Mountain. A guest room with a lofted sleeping area and fireplace.